Just before I started driving a cab, Philadelphia’s cab drivers had been on strike for better pay. The new contract that was bargained got better retirement benefits for the retired drivers and soon-to-retire drivers, but no pay increase for current drivers. This was because by 1975 most of the current drivers were just college students or graduate students (like me) and were not planning on making cab driving a permanent career. So it was easy for the union to sell us out in favor of the retirees. But there was this one young driver named Sal whose Dad was a driver and who planned on being a driver for his entire life, just like his Dad, and he was pissed. So he asked for my help. Eventually I got a volunteer labor lawyer to meet with us and we started in on forming a new union. We had regular Sunday night meetings in a church basement. Usually no more than 10 to 20 drivers attended. A start maybe, but not a critical mass yet. On one of those Sunday nights me and Sal were talking after the meeting about our pasts, and somehow doing acid came up. He said he really enjoyed tripping and wondered if I knew where to get some. I said yes, and en route he convinced me to drop with him. I wasn’t driving the next day and didn’t have any Monday night classes at the law school. You need to budget in a 24 hour period if you’re going to trip. And I knew my source (my sister) so I knew the LSD didn’t have any strychnine in it. But it never occurred to me to ask if he was planning on driving the next day, or inquire if he had done real LSD in his past versus just some low-level street acid laced with speed that wears off quicker. My sister lived right in Center City Philadelphia about 4 blocks from Broad & Walnut, the site of the busiest cab stand in all of Philadelphia. So we drop about midnite and an hour later when we start peaking I suggest going for a walk. Every one of my acid trips (maybe eight times in my life) involved being with a crowd, out on the streets or at a concert, with plenty of people to watch or interact with. I was not someone who enjoyed just getting into my own head or interacting with nature when I tripped. Well, of course, where did we walk to, but Broad & Walnut. And while walking Sal’s telling me this is really good acid and he’s never been so high. When we get to the cab stand we try to be inconspicuous standing on the corner opposite, but, of course, all the drivers know Sal and wave at us from time-to-time. We are figuratively frozen, practically speechless, and not very good at waving back. We have to get out of there. So we inch our way down Walnut towards my sister’s, literally feeling each step of the way by having our hands on the building next to the sidewalk we’re on. Only all of the sudden we both think we’re on Broad Street not Walnut, so we inch our way back to the corner to regain our bearings. Is that City Hall down there? I don’t think there has ever before been, or ever will be again, a time two experienced Philly cab drivers were lost at Broad & Walnut. 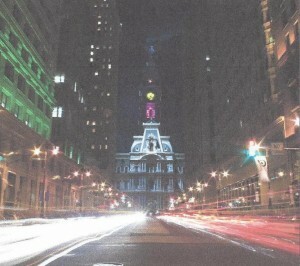 Every time we started down Broad Street we saw the lights of Walnut Street in our heads. Every time we started down Walnut, we vividly saw all the dazzling lights of the Broad Street Scene with City Hall and the golden-lighted William Penn Statute on top – so we’d feel our way back to the cab stand corner once again. We were lost for what seemed hours. And, of course, although we didn’t quite intuit what it meant yet, the other cab drivers noticed how lost we were.